Faqeer Abdul Ghafoor Sindhi Sufi Music Singer. He was born on 1910 in Village culture and feudal society of SindhHe most popular Sindhi Old Classical Music Artist. He was sung lot of great songs in Sindhi and Saraiki languages and he create great name in Sindhi Music. Faqeer Abdul Ghafoor grew up surrounded by the sounds of the Shrines and the "Sindhi Kalam" of the "Sufi Poets" and took up the study and practice of music at his early age. When he was young, the music of the shrines was the dominant form of musical expression at the popular level. Faqeer Abdul Ghafoor "Turbaned Figure", "Yaktaro" held aloft, steps onto the stage. Beside him is a smaller, younger man, several other Saffron robbed Faqeers follow open roar. 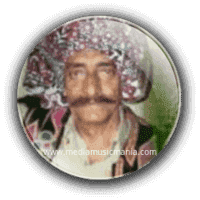 Faqeer Abdul Ghafoor sung lot of great Sindhi Sufi Music, Classical Music and he had sung great songs and love with "Hazrat Sachal Sarmast R.A" and it was at his shrine, that Faqeer Abdul Ghafoor received his early training. He had sung with its rural base, its "Autaqs" and most important of all as far as the music is concerned, Shrines and "Peers" and "Faqeers". Specially in Sindh the shrine Sufi Buzrigs was the gathering place for many great Artists of Sindh and they sung "Kaafi Raga" and gained invaluable experience, listening to them and storing away their particular styles and approach, he sung also poetry of "Hazrat Shah Abdul Latif Bhitai R.A. This great singer was breath his last in 1986. I have selected below most popular Music of Faqeer Abdul Ghafoor.